Jane (Jean) Muir WATSON was born 10 January 1899. She was the seventh child and third daughter of Thomas WATSON and his wife Jane MUIR. Her father had taken a job as a ploughman at Newton Farm, Cambuslang, Lanarkshire, Scotland and they lived in one of the farm cottages where Jean was born. Jean’s sister Nell [Helen McNab WATSON] was nine years older than Jean and it is probable that Nell was required to care for the baby. Their mother Jane would likely have been preoccupied with the toddler Mary [Mary Hunter WATSON], who was ill and died just over a year after Jean’s birth. Nell and Jean were close all their lives and visited almost weekly until Nell’s death in 1967. 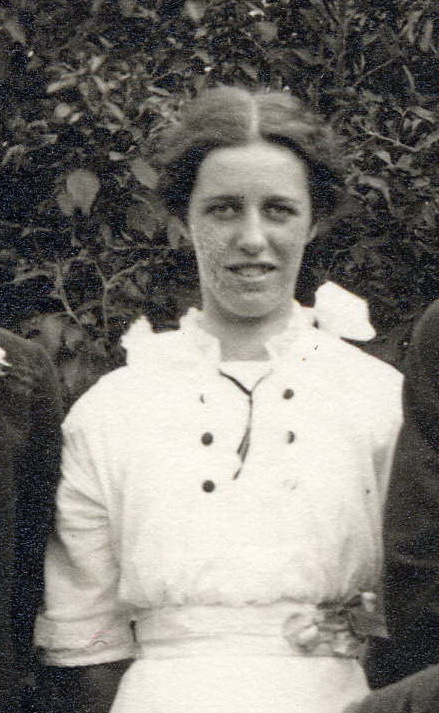 Although Jean was the second youngest of Tom and Jane’s eight children, she likely did not long enjoy the position of cared-for younger sister. By 1905, when Jean was 6, both her older brother Tom [Thomas WATSON] and her beloved sister Nell worked away from home. In 1906, when Jean was 7, her brother Jim [James Muir WATSON] left to seek his fortune in far-off Canada and started the family’s eventual move to that country. In 1909 her brother Bill [William Watson Muir WATSON] followed Jim to Canada. After Bill left the Watson family at home consisted of only Jean, 10, and her older brother Alex [Alexander Hunter WATSON], 14, younger brother John [John McConnell Muir WATSON], 6, and her parents. As the eldest daughter at home Jean would have responsibilities to help her mother cook and clean, as well as attend to her own school work. Some 1909 photographs from Jean’s school in Scotland have survived. Photo right: Jean’s School photograph for school year 1908-1909. In April 1910, when Jean was 11, she was part of the Watson family that immigrated to Saskatchewan. She continued her schooling in the Rosewood area, and was involved in community activities such as the Red Cross. In her late teens Jean moved to Regina and took a secretarial course. She worked at the Regina branch of Credit Foncier, a large mortgage company with offices across Canada. She was employed by the company for many years, probably as a senior secretary or administrative assistant, until her retirement in the 1960s. Her apartment, in the Credit Foncier building, was a window-filled corner unit which overlooked the manicured green lawns and flowers of Victoria Park in downtown Regina. It was a tiny unit – although it seemed large when I was a child – filled with lovely furniture and nick-knacks. My country cousins and I were always amazed at the compact neatness of the apartment. We were also amazed at the concept of such a small living space since many of us lived on sprawling farms with homes that leaked dust and weather. To be asked to spend a few days staying with ‘Aunt Jean’ (as she was known to everyone) in her Regina apartment in the centre of a big city was a treat beyond words when we were growing up. Aunt Jean was everyone’s favourite aunt and regularly visited her siblings and their offspring. Dozens of photos exist documenting her numerous visits which were highly anticipated as her suitcase always carried small gifts and treats for every child. She was a welcome visitor in all our homes. A happy, fun loving person she was, within reason, prepared to do anything to the delight of we children. She was always smiling, or laughing, or preparing to do so. Her hair, which turned a lovely soft white during her 20s, was always neatly pinned. I don’t remember seeing her wear anything other than a dress and smart shoes; but her stylish attire didn’t stop her from climbing either onto a horse cart or up into the loft of a barn. 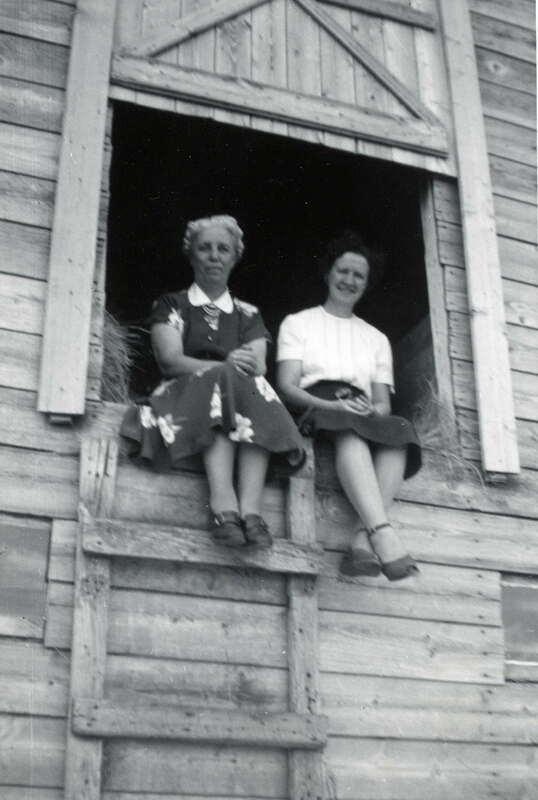 Photo right: Jean, left and unknown friend enjoy the view from the loft of a barn, Saskachewan. about 1950s? Jean and her sister Nell remained particularly close. For years each weekend Jean traveled by bus (for all her independence she never learned to drive) from Regina to Lemberg to stay with her sister and brother-in-law Joe [Joseph Francis ACTON]. 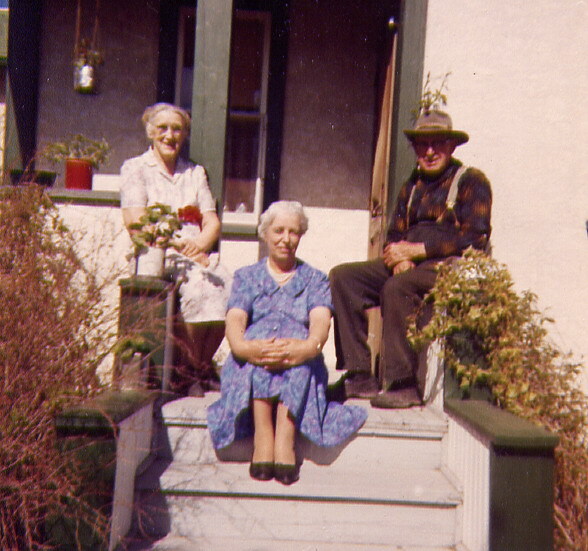 Photo below: Jean, centre in blue dress, with her sister Nell and brother-in-law Joe. After her retirement in the 1960s Jean moved to Calgary. A few years before her death she returned to Saskatchewan and moved into the senior’s residence in Balcarres where her brother John lived. She died in Balcarres on the 27 June 1988, and is buried beside her brother John in the Ellisboro Cemetery in the Qu’Appelle valley.